Home >> Can you breathe easy in your castle? Can you breathe easy in your castle? I used to work in a beautiful heritage building in Vancouver called The Standard Building. To me, it was anything but standard with glossy marble floors, polished brass fixtures and a gorgeous lobby that made you feel you’d arrived someplace special. It was a great place to work except for one thing… our office neighbour was a smoker. I don’t know if it was the age of the building or the way the offices were subdivided but when he lit up – our office became his ash-tray. For me, it was stinky and distracting but one of my co-workers was asthmatic and sometimes it got so smoky she had to leave the office. Then when I became pregnant I became worried about my baby’s exposure to second-hand smoke. But luckily (for me the glass is half full) – this was my office, not my home. I could leave the smoke behind at the end of the day. Unfortunately, this is not the case for many who live in apartments, condos, townhouses or other types of adjoined suites. After all the efforts to protect the public from second-hand smoke, it’s a bitter irony that some still have to deal with unwanted smoke in their homes. In fact, over a third of residents in multi-unit dwellings are exposed to second-hand smoke each year. So it’s not that surprising that each year about 100,000 are estimated to move to escape from second-hand smoke. Living with smoke in the home is a health issue for anyone but it’s particularly serious for those with asthma, bronchitis, emphysema and other respiratory conditions or chronic illnesses. This is what led BCAHL to fund the Smoke Free Housing initiative and why we continue to advocate for more smoke free housing options. To learn more about this issue please join us and tobacco experts, Jack Boomer and Sharon Hammond in our upcoming webinar:Beyond the Tobacco War – What’s Next in Prevention & Protection? on Wednesday January 30th at 9am. Because everybody should be able to breathe easy in their own home (or castle). 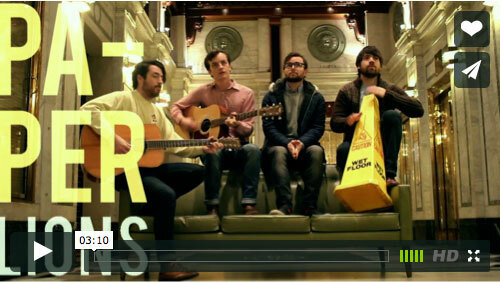 Green Couch Session Paper Lions from Green Couch on Vimeo.